Maria Montessori called her environment for 3- to 6-year-old children Casa dei Bambini or “Children’s House.” Multi-age classrooms, the hallmark of Montessori programs, help develop a sense of community and encourage cooperation and collaboration. Younger children learn from older ones, and older children reinforce their learning by teaching concepts they have mastered. At this stage, Montessori materials encourage children to refine the multitude of sensory impressions absorbed throughout their toddler years and help them organize and classify the world around them. 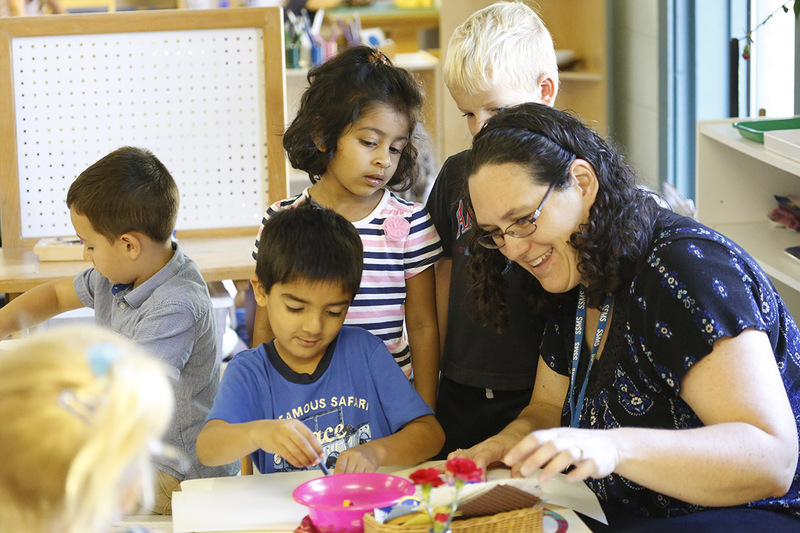 Through listening and oral language, students develop strong writing and reading skills within the Montessori Language curriculum, and abstract mathematical concepts are absorbed through the manipulation of Montessori Mathematic materials. Students in the Children’s House environment are also introduced to concepts in science, geography, art, music, movement and cultural studies. This multi-sensory and integrated approach to learning aids in the development of a whole child. South Suburban Montessori School has three Children’s House environments. In all three environments, 3- and 4-year-old children attend five days a week from 8:30am to 12:45pm. The five-year-old students in their third year stay until 3:15, allowing for a longer work cycle known. This extended time during this third year is the equivalent of Kindergarten. Our Children’s House Encore Program is our aftercare program. Children can be picked as late as 6:00 pm. The 3- and 4-year-olds start at 12:45pm, while the 5-year-olds join at 3:15pm. Children enjoy outdoor play, gardening and other activities. We provide a nurturing, secure environment based on Montessori principles to children who need to spend a longer day in school. After completing the Children’s House experience, students are well-prepared for Lower Elementary.